Your java is not turned on. Graphics and texts in this site are copyright of "Kenfthis Graphic & Design". Their use are only allowed after express permission of the author. 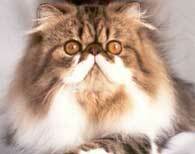 Pictures are copyright of the photographers and property of Kenfthis Cattery. Hi there! Giangi and Grazia welcome you to their homepage! Our main goal has always been to breed seriously giving much more importance to the quality of our cats than to the quantity. Since the very beginning we have always been so lucky to meet fellow breeders which helped a lot telling us everything they knew from their breeding experience without preclusion. by FIFe in 1987 and by CFA in 2000. 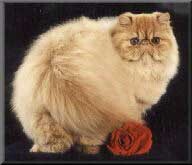 Our fist show successes started with "Odissea of Kenfthis", a Tortie Persian which in 1991 became Best Adult Cat all Breed in our National FFI Championship. The second important turning point for our breeding has been the arrival of the superb "Borgo Ala Tutti Frutti", another Tortie Persian from Mario Ottino's cattery "Borgo Ala". Mario believed in that kitten's potentialties since the beginning even if her show results as a kitten were not so exalting. It has been love at first sight and Tutti Frutti came to live with us immediately. Fruttina, as she is known, won over all her competitions everywhere she has been presented, collecting an impressing number of Best in Show and Best of Best and becoming for two conseguent years Best Adult Cat all Breed in FFI. No other cat, up to now, could do the same and repeat her incredible show career! Now to the third turning point, probably the most important for our breeding. In 1994 an outstanding male arrived from the States: GC RW Jelliebeans Jimmy'Z DM, a Red Persian boy, coming from Barbara Brick's CFA Cattery "Jelliebeans". He was a boy of a real beauty which always passed on that particular "LOOK" to his kittens. It has been their sign of distinction and the secret of their show success throughout Europe! Again in 1994 we started breeding Exotics getting excellent results and important show success too! Today our cattery is made up of about 10 cats, mainly in solid colours, which we love particularly: Red, Black, Tortie and Tabbies. - Werther Gardella and Mauro Boni - Meneftha Cattery - that with their precious help introduced us to the cat fancy world for first. -Mario Ottino - Borgo Ala Cattery - one of our dearest friends and mentor which gave us, by means of Tutti Frutti, the possibility to reach the highest position in Championship for many years and to become well known in Europe. He also contribute to Gangi's decision to become FIFe International Judge in 1998. - Barbara Brick - Jelliebeans Cattery - which, thanks also to our dear friend Alex Di Chio's help (Di Chio's Cattery), allowed us to have Jimmy'z. Europa with our cats getting great success and letting them known and admired. - All Kenfthis' cats owners which traveled throughout Europa with our cats getting great success and letting them known and admired. 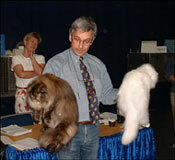 - All Judges (FIFe and CFA) which during these years always appreciated our cats' quality. And now, all you have to do is turn the page and enjoy our precious champions' gallery!